Rice balls known as onigiri are a common breakfast for the Japanese. However, many things are a little different in Okinawa, including the rice ball. 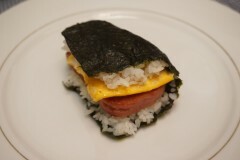 A popular variation here includes a slice of spam and fried egg wrapped on the ball of rice with nori seaweed. People often take this beefier rice ball to eat as snack or even lunch at work or school.Besides, many people on Okinawa like to have just fried spam and eggs for breakfast. Because Hawaii has a large number of immigrants from Okinawa, a similar onigiri is popular there, too. In addition to the regular spam and egg rice ball, local convenience stores sell a variety of them, including onigiri with tuna and mayonnaise, aburamiso, and komatsuna (Japanese mustard spinach). In Naha, there is a specialty shop called ‘Pork and Egg Onigiri Main Store” that sells a wide variety onigiri with ingredients between the rice ball ranging from a pork cutlet to shrimp tempura. The shop is open daily from 07:00 to 17:30, except closed on Wednesdays. The shop is located at 2-8-35 Matsuo, Naha City.